I really hope that people wont call this realist painting of a pear as a photorealist still life artwork! The art style of photorealism has probably, its artistic merits, only that my goal is not to get comments like “WOW! It looks like a photo!” . I know ! I really know that people saying that are willing to make a compliment to the artist. Unfortunately, they don’t even mind that the artist is getting angry in those moments. I guess that people rather say “It look almost real!”if they would know the quite big difference between realist art and photorealist art style. So, it’s good to know that one better say “Looks pretty real! instead “WOW! It looks like a photo!” if that one want to praise the artist’s artwork! …only if the artist himself didn’t mention that his paintings are photorealist. 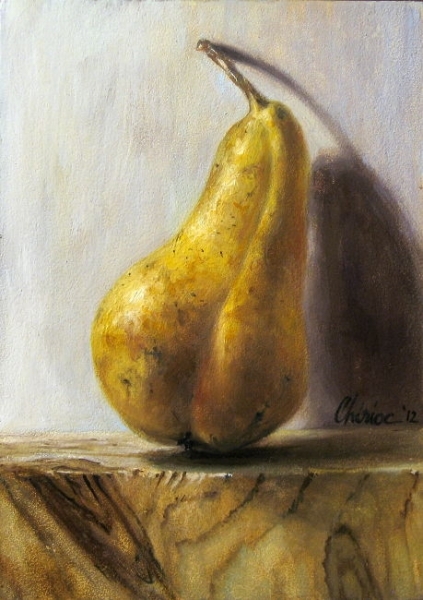 Now, about this realistic painting of a pear: I managed to get ready a commissioned portrait painting. Because it’s a lot of time since the last still life painting I’ve made, I thought that is time for doing a new realist still life oil painting of fruit and because I like pears, I have painted a realist fine art painting of a pear. I took a nice pear, I put it on a piece of wood and made it “alive” on the panel through my brushes and oil colors. All I know now is to get a small exclamation : “WOW! It looks like a photo!” hahahaha Don’t even mind! It’s a small artwork piece of realist art, oil on panel. It’s sized 5×7 inches. Check my paintings for sale to see if this painting is still available. Watch the breakthrough video of making this small realist still life painting. Thanks for the videos, especially the easy way to paint a pear. Your work is amazing and most of all inspiring.